We've got the shots to prove it. After Aston Martin of the drop-top DB11 in prototype form back in September, thanks to our intrepid spy photographers we can now check out from a range of different angles what appears to be the exact same test model undergoing cold weather testing in snowy Sweden. The Aston Martin DB11 Volante won’t be hitting dealerships until spring 2018 (note the “opening Spring 2018” graphics on the door), so we expect to see the car at the 2017 Geneva Motor Show this March. We have every confidence it would take home the crown of sexiest convertible of the show award if such an award existed. Powering the DB11 Volante will be the same 5.2-liter twin-turbo V12 as the coupe, generating 600 hp and 516 lb-ft of torque. The 4.0-liter twin-turbo V8 motivating the Mercedes-AMG GT will also be an option after it that’s set to arrive next year. As you can see, Aston will employ a fabric roof like the DB9 that preceded it with sound-deadening properties to keep occupants well cocooned in the luxurious cabin. We also suspect the suspension will be softened a tad as four-seater convertible buyers tend to favor cruising over street racing. That said, it should still manage to . 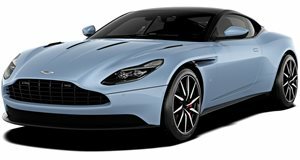 With the DB11 priced at just under $212,000 in the US, expect the DB11 Volante to carry a price tag nearer to $230,000 as it goes up against the likes of the Ferrari California T and Bentley Continental GT Speed.